If you're anything like most travelers, your carry-on bag is a multi-purpose home for many things. In my case, it often ends up carrying a laptop, tablet, chargers, earphones, sunglasses, book or e-reader, portable battery, passport, boarding passes, booking confirmations...the list goes on. As a result, going through security becomes a frustrating exercise, especially in airports where absolutely every piece of electronics needs to come out of the bag. Once onboard, finding anything inside the bag is equally annoying, whether it's under the seat in front or stowed up in the overhead bin. I've looked at several organizers over the years, all touting the ability to easily store, transport, and use your travel essentials, but none have particularly caught my eye. Australian company Airpocket thinks it's come up with something a bit different, however, and sent out a sample of its Kickstarter-funded version to take a look at. Measuring 11.8" x 9.8" x 2.4", the Airpocket is made from a thick, durable neoprene. It's soft enough that it won't scratch screens or eyewear, with enough padding to offer reasonable protection for whatever's inside. It's also small enough to count as a personal item for most airlines–in other words, you can usually take it in the cabin in addition to your carry-on bag. You wouldn't want to drop it onto concrete from head height, but it offers plenty of protection from the kind of knocks and falls travel typically throws at your electronics. On the flip side, the padding does make the Airpocket bulkier than many other organizers. Style-wise, it has a primarily black design, with red accents for the band across the back and interior pouches. The band is quite wide, and used for slipping the organizer over the extended handle of a rolling suitcase. That's a smart idea, as it makes it easier to carry when you're on the move. Speaking of carrying, it comes with a removable strap that can be attached to a pair of hooks near the top to let you use it as a messenger bag. 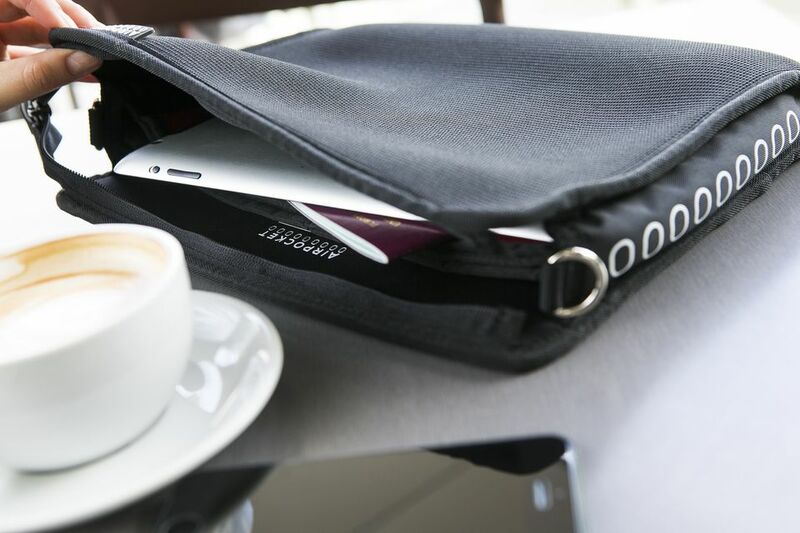 Once on the plane, the Airpocket is designed to fit into a standard seat-back pocket. Inside, the organizer is split into several compartments. Two sections run the full length, intended for tablet computers, books, e-readers or similar, as well as paper documents. You could possibly fit a small laptop like the 11" Macbook Air, but it'd be a tight squeeze. Anything larger would be out of the question. The other compartments are different sizes, allowing for things like phones, passports, chargers, and other accessories to be dropped inside. There's even a narrow section to clip a pen into, for filling out those annoying landing cards. The company also sells a see-through amenities case at extra cost, which can fit inside the Airpocket and store a bunch of smaller items together. Putting the Airpocket to the test on a trans-Atlantic trip, I filled it up with the key things I'd be likely to want on the eight-hour flight. To that end, I included a 7” tablet, passport, portable battery and charging cable, the book I was reading, a smartphone, and a pen. Anything that usually lived inside its own case–the tablet, phone, and passport– stayed that way. The end result was a somewhat bulky and heavy organizer, but everything fitted without a problem. I was able to quickly drop my keys and wallet inside, too, when walking through security scanners. Since my carry-on was a backpack rather than rolling suitcase, I hadn't been certain how well the Airpocket would work for me. In the end, I opted to use the strap and wear it across my body, sitting it on one hip with the backpack over top. It was more useful and comfortable than expected, and I was still able to easily unzip it and pull out my passport at check-in without having to remove the backpack. Onboard, the organizer fitted into the seat pocket easily enough, although the extra thickness was noticeable. It's something that would be more of a problem on super-cramped budget airlines, where legroom is already an issue. You'd want to reduce the amount inside to an absolute minimum when taking one of those flights. I liked the Airpocket more than expected. It's well-designed, and sturdy enough to take a few knocks. The option to carry it in three different ways (over a suitcase handle, as a messenger bag, or in your hand) is a welcome one, making it useful in more situations than much of the competition. Being made from neoprene has both pros and con. On the upside, the extra stretch is useful if you're trying to squeeze in a larger item, and that choice of material provides some much-needed padding and water resistance. It definitely adds to the bulk, however, and if you're already struggling with leg space on your flight, you'll notice the difference, especially if you've stuffed quite a bit inside. The price is reasonable for a solid piece of luggage like this, at around $70, although it may be hard to justify for the price-conscious since it's only really likely to get used when flying. Overall, if you travel regularly and are in the market for an organizer of some description, the Airpocket should make it to your shortlist.